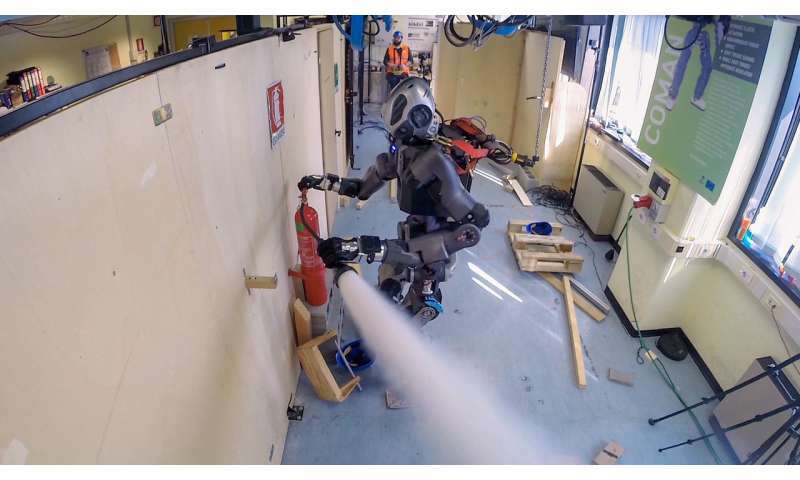 Researchers at IIT-Istituto Italiano di Tecnologia tested a new version of the WALK-MAN humanoid robot for supporting emergency response teams in fires. The robot is able to locate the fire and walk toward it, and then activate an extinguisher. During the operation, it collects images and transmits them back to emergency teams, who can evaluate the situation and guide the robot remotely. The new WALK-MAN design has a lighter upper body and new hands in order to reduce construction cost and improve performance. The WALK-MAN robot is now at its final validation phase. The project also involved the University of Pisa in Italy, the École Polytechnique Fédérale de Lausanne (EPFL) in Switzerland, the Karlsruhe Institute of Technology (KIT) in Germany and the Université Catholique de Louvain (UCL) in Belgium. The partners contributed to locomotion control, perception capability, affordances and motion planning, simulation tools and manipulation control. The validation scenario was defined in collaboration with the Italian civil protection body in Florence, which participated in the project in an advisory capacity. During the final test, WALK-MAN dealt with a scenario representing an industrial plant damaged by an earthquake where gas leaks and fire were present, a dangerous situation for humans. The scenario was recreated in IIT laboratories, where the robot was able to navigate through a damaged room and perform four specific tasks: opening and traversing the door to enter the zone; locating the valve controlling the gas leakage and closing it; removing debris in its path; and identifying the fire and activating a fire extinguisher. The robot is controlled by a human operator through a virtual interface and a sensorized suit, like Tony Stark in Iron Man. The operator guides the robot from a station located remotely from the accident site, receiving images and other information from the robot's perception systems. The first version of WALK-MAN was released in 2015, but researchers wanted to introduce new materials and optimize the design to reduce fabrication costs and improve performance. The new version of WALK-MAN has a lighter upper body, which took six months to develop, involving a team of about 10 people coordinated by Nikolaos Tsagarakis, researcher at IIT and coordinator of the WALK-MAN project. The new WALK-MAN is a humanoid robot 1.85 meters tall made of lightweight materials, including Ergal (60 percent), magnesium alloys (25 percent) and titanium, iron and plastics. Researchers reduced its weight from the prototype's 133 kilos to 102 kilos, making the robot more dynamic. The legs can move faster, having a lighter upper body mass to carry. The higher dynamic performance allows the robot to react faster with its legs, maintaining its balance under the effect of physical interaction disturbances—this is very important to adapt its pace to rough terrain and variable interaction scenarios. The lighter upper-body also reduces its energy consumption and the WALK-MAN can operate with a smaller battery (1 kWh) for about two hours. The lighter upper body is made of magnesium alloys and composite structures, and it is powered by a new version of lightweight soft actuators. Its performance has been improved, with a higher payload (10 kg/arm) than the original one (7 kg/arm); thus, it can carry heavy objects for more than 10 minutes. The new upper body is also more compact in size (62 cm shoulder width, 31 cm torso depth), giving to the robot great flexibility to pass through standard doors and narrow passages. The hands are a new version of Soft-Hand developed by Centro Ricerche E. Piaggio of University of Pisa (group of Prof. A. Bicchi) in collaboration with IIT. They incorporate composite material for the fingers, and have a more human-like finger-to-palm size ratio that allows WALK-MAN to grasp a variety of object shapes. Despite their weight reduction, the hands have the same strength as the original version, with similar versatility in handling and physical robustness. 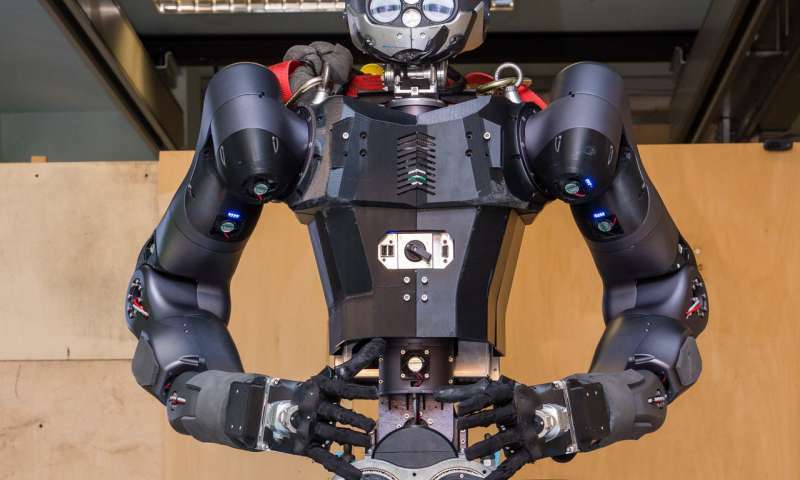 WALK-MAN body is controlled by 32 engines and control boards, four force and torque sensors at hands and feet, and two accelerometers for controlling its balance. Its joints show elastic movement allowing the robot to be compliant and have safe interactions with humans and the environment. Its software architecture is based on XBotCore framework, YARP platform, ROS e Gazebo. The robot head has cameras, a 3-D laser scanner, and microphone sensors. In the future, it can be also equipped with chemical sensors for detecting toxic agents.